as you know the drop information in our database is far from being complete. This is because we are unable to datamine this information like we do with most other information like monsters, items and skills. We tried to find some kind of other automated method to get the information but came to the conclusion that (for now) the best way to get this information is via user contribution. We already received such information but we wanted to get things more organized so we created a new feature for this. The new feature allows you to fill in all information we need and send it to us. We will then verify this information and add it to the database afterwards. We will use screenshots of the Adventure Journal as source as this is the most reliable source. More details about this can be found on the Contribution Page. We hope this will help us improving the database and make it as complete as possible. What about recipe drops? 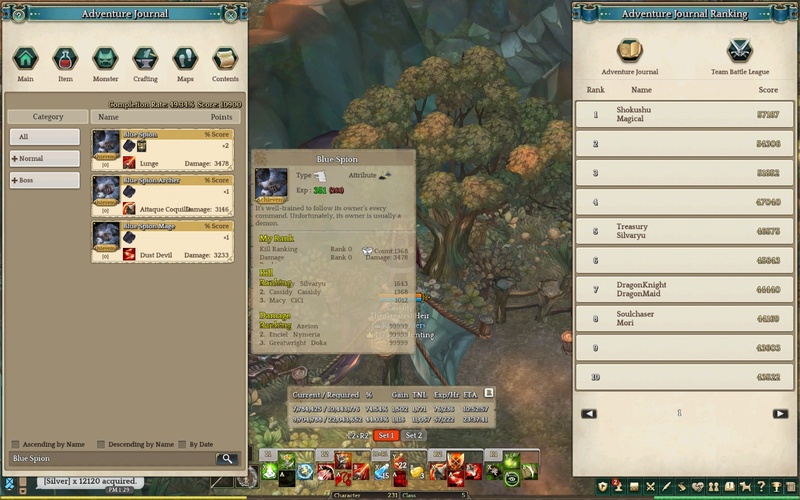 The contribution page says to use adventure journal entries but recipes don't show up in the adventure log. Recipe - Bandit Pants drop from Blue Spions but it does't not appear. Just add them the same way, without a picture on imgur. we will then try to verify the report and add them then. is it possible to make addon for autorepot game info, like WoWHead? Excrulon and a few other people are working on a addon to do something like the wowhead client. He committed a journal export to his addons a few hours ago. Last edited by Navitron on August 17th, 2016, 4:31 am, edited 1 time in total. all monster from klaipeda till tenet church 1f are in the file already, and some monsters from orsha too. Navitron wrote: Excrulon and a few other people are working on a addon to do something like the wowhead client. He committed a journal export to his addons a few hours ago. If anyone wants to see the output I put it on my Google Drive it outputs a json file. yeah, get a Github update, looks good. other question - can tosbase use this data format for now? Using the data from the files should be no problem. However the files won't be parsed in real time (at least not for now) but instead I'm probably going to parse the new files once a day. a few users can confirm most of loot, so don't think it a problem. on particularly rare loot, you can create special queries. I will parse all new files tomorrow. @FLash : could you please update your post with the Exclursion addon and the page you wrote to upload the .json file ? That's just a suggestion for people who won't read the comment. Great work you're doing here. I'll contribute what I can. Tosbase.com is the place to go when looking for info. Still a long way to go but we're slowly getting there! How exactly works this addon? I've been searching info but I don't understand how to install it or which is the file(journal) that I need to upload, sorry. anybode know reason, why journalexport was removed from github? i made a copy just in case. Tristis Oris wrote: anybode know reason, why journalexport was removed from github? i made a copy just in case. Apparently Excrulon wasn't happy about the addon anymore because it wasn't 100% accurate (due to bugs in the Adventure Journal). I'm not sure why he had to remove it because it's still useful the way we are using it. We will probably upload the addon and post a little guide how to get it back working, soon.